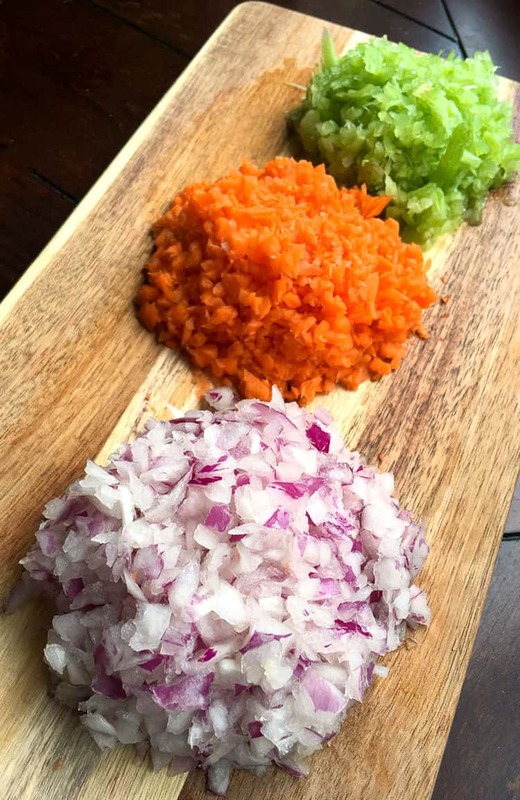 Looking for a delicious and hearty ragù recipe? 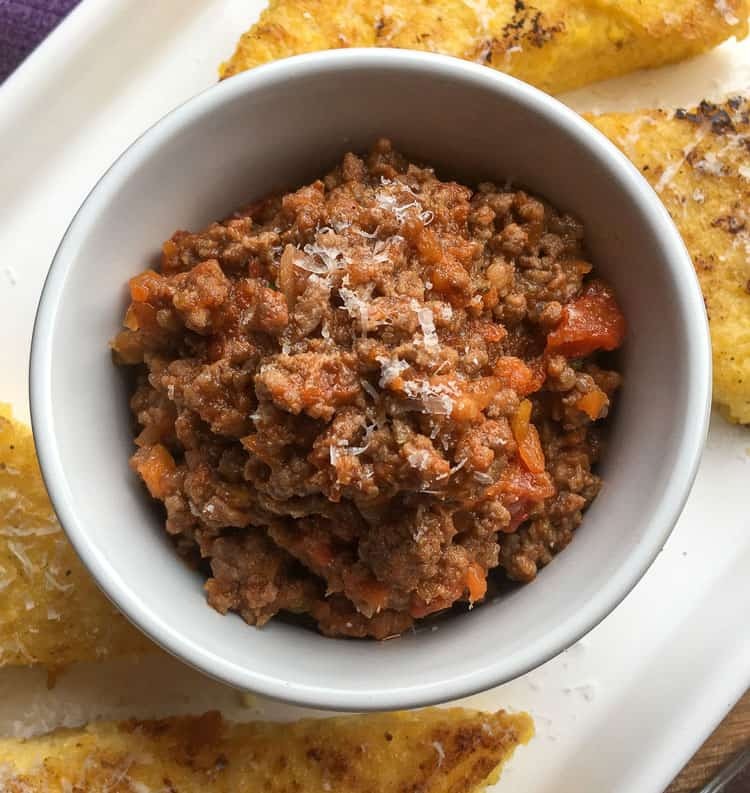 Tuscan Beef and Sausage Ragù is rich, flavorful, and pairs wonderfully with polenta, making it a completely gluten-free dish. By using a red onion in this dish instead of traditional yellow or white, the dish packs a punch of sweetness that contrasts nicely with the earthy goodness of the porcini mushrooms. No additional herbs or spices are required to give Tuscan Beef and Sausage Ragù maximum flavor. Ragù originated in Italy. Traditionally, it is the name used for a sauce served with pasta that is heavily meat-based. (And, of course, it’s also the name for a popular brand of pasta sauce!) However, ragù doesn’t have to be served with pasta. In fact, this ragù recipe is completely gluten-free (and low in carbs too). Tip #1: For even more flavor in this wonderful dish, instead of reconstituting the porcini mushrooms in water, reconstitute them in beef broth. It’s important that you strain the liquid with a cheesecloth or coffee filter before adding it to the sauce to remove any sediment. Tip #2: Don’t substitute the red onion. If you don’t have a red onion on hand, it might be tempting to use a white or yellow onion instead, but the red onion is an important part of the “soffritto” — the name for the trio of aromatics that creates this sausage ragù’s wonderful flavor. The beauty of Tuscan Beef and Sausage Ragù is it’s so versatile. While ragù is traditionally served with pasta, that doesn’t mean you have to serve it that way! 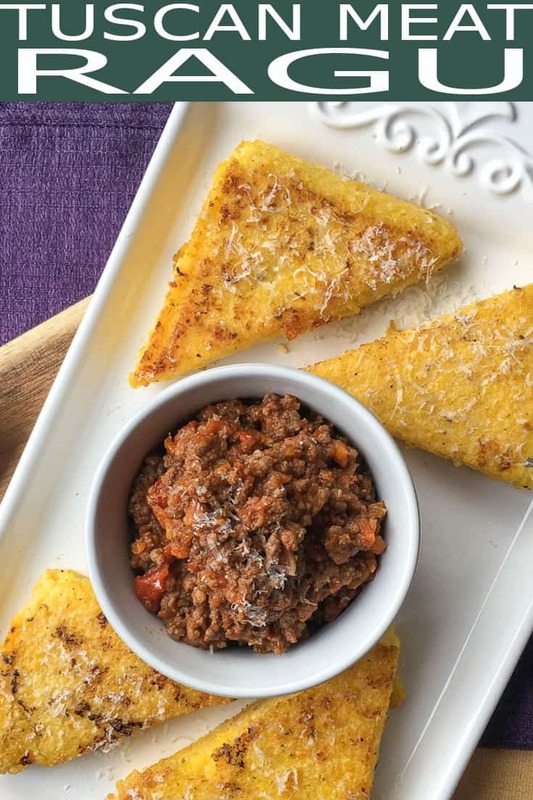 Tuscan Beef and Sausage Ragù is particularly good when served with polenta. 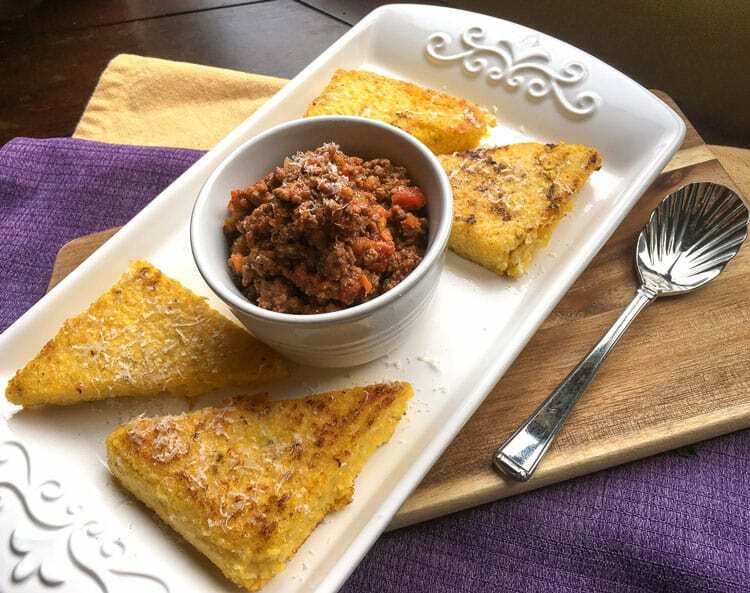 It tastes amazing on a bed of warm, creamy polenta for a main meal, or you can serve it on top of grilled polenta wedges for a delicious appetizer. If you don’t know how to make polenta, check out my How to Make Polenta: Creamy Polenta, Grilled Polenta, or Fried Polenta post for all the details! For a gluten-free option, the above-mentioned polenta is a good choice. For a low-carb option, try serving Tuscan Beef and Sausage Ragù on its own or with low-carb crudites. You will love this rich and flavorful dish! In a 5- or 6-quart Dutch oven over medium-high heat, heat olive oil. 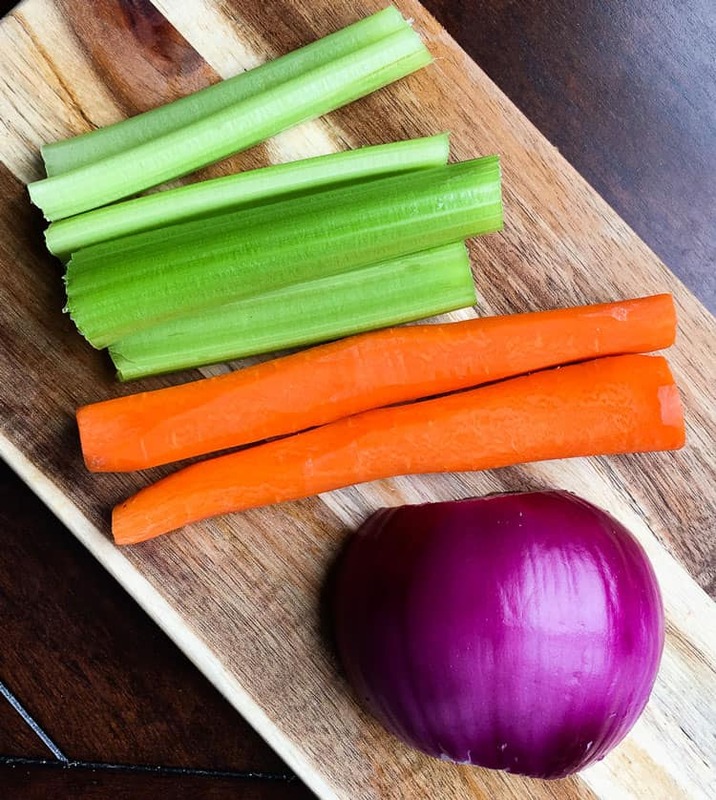 Then add red onion, carrots, and celery. Cook, stirring frequently, until the vegetables are nicely caramelized and tender (about 8-10 minutes). Add the chopped mushrooms and sausage. Stir frequently and use a wooden spoon to break the sausage into smaller pieces. Cook until the sausage is no longer pink. Add the ground beef and cook until it has browned. When finished, if any excess fat is in the pot, carefully drain it and discard it. Add wine. Deglaze by using a spatula or wooden spoon to scrape up any brown bits from the bottom of the pan. When the wine has reduced by half, add tomatoes and the liquid that was used for reconstituting the mushrooms. Stir to combine, then season with salt and pepper to taste. Reduce the heat to just below medium. Continue to cook for another 45-50 minutes while stirring occasionally. If the sauce begins to dry out, add a little water while it is cooking. « 20 Must-Try Copycat Recipes!